@Jose D wrote: I have been using the first tile wand that tony made with brush head for about 1.5 years now. It gets the job done but it takes me longer to clean tile. I actually hate cleaning tile with the wand and hope to upgrade to a spinner tool eventually. I started with a spinner, an SX-12, and used it for years...........then bought a Gecko with 14" brush head about a year ago, and have only used spinner twice since then. I like how the Gecko edges better and gets into corners, unlike a spinner. 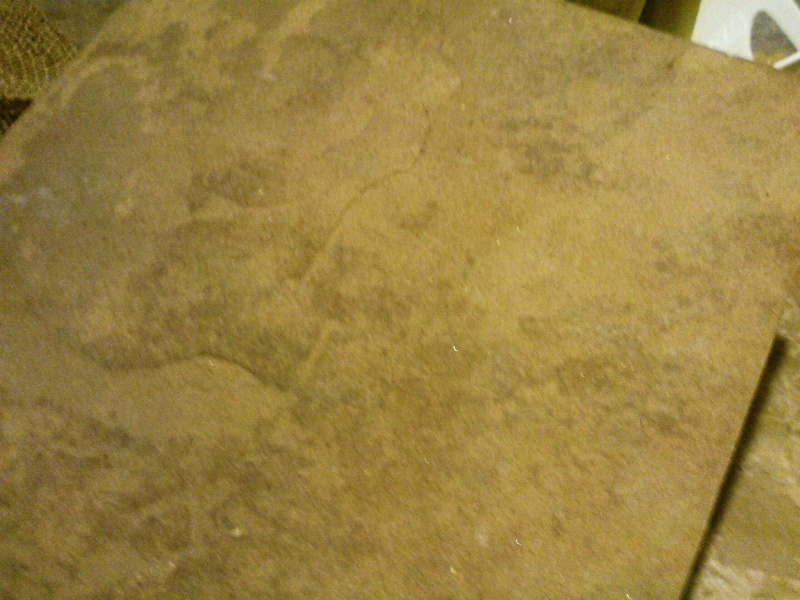 Here is the church tile that is very porous and wares out mops, can it be sealed so it doesnt trap dirt? Is that concrete?........or just a really close up pic of a tile? Post a pic of the back side of it, if it's a tile and I'll tell you what it is......Right DP? I suspect it's a man made stone look a-like tile. Can't really tell by the photo, but I would guess that it has a crystalline look to it and feel like sand paper.....am I close? You can seal anything, but it isn't always a good idea. If it is what I think it is, the texture is there for safety so nobody slips when wet. Sealing it would make for a dangerous surface. It is very similar to a polished cement with quartz and glass added to the mix. I wouldn't try and seal that stuff at all. As for cleaning, stay away from acid-based cleaners. Any of the standard high alkaline cleaners for tile should be okay. Don't expect miracles as it will probably dry to a flat and dull appearance. You are looking for clean, but not shiny. I have seen some with an acrylic coating to give it some shine, but the stuff turns yellow and ruins the safety texture as well. Is there a pic of this?...that must be a video above because I cant see videos right now. @Devon07 wrote: Is there a pic of this?...that must be a video above because I cant see videos right now. Good Morning, page 2 has the pic but when I start the cleaning of the church I will use wife's video to video it. The foyer is tile, entrance is tile and bathrooms are all this type of tile, lots of this tile and it wears mops out and always looks dirty. @Davey Cracker wrote: Is that concrete?........or just a really close up pic of a tile? If it's rough, I wouldn't use gecko / tile wand or spinner, after pre spray I would scrub and just pressure wash it, I hope it's outside ? If it's inside, and there's drain somewhere, you can still do it, just pressure wash going towards the drain and I agree with Rob, I wouldn't seal that stuff or you're going to hate yourself next time you're cleaning it, lol. I just find it easier most of the time to do whole job with Gecko, rather then having to switch back and forth to get the edges properly, and corners with Gecko when using the spinner for the open areas. Hey Mo, How is the water recovery with the squeegee head? I did some video cleaning with the blaster and sx12 today. Unfortunatley i messed up and didnt record most of it. I do have a before and after with both. I ran the pump at 900 PSI. What I tried to do was do 2 wet passes and two dry passes on with both tools. No Im trying to remember if I took my had on the sx12 trigger on the second pass check it out. Looks like the SX cleaned much better? its does look like the spinner cleaned better but it could have just been a different spot on the concrete that looks different. Yeah that's possible AC but again I think were comparing apples to oranges. We need someone that has a Gecko to do that test and can be Brutally Honest. PS I clean my AZ room with the blaster and it came out good. Brian let me know if you want the loaner to clean the church. Anybody else want to use it? So am I correct in my assumption that spinner clean better that hard surface wands? I mean how much difference can their be with regards to cleaning ability between a Gecko and any other hard surface wand. Sure the squeegee might last longer than another or better recovery but from a pure cleaning stand point it appears to me than a spinner does abetter job of using water to clean. @Mo wrote: Yeah that's possible AC but again I think were comparing apples to oranges. We need someone that has a Gecko to do that test and can be Brutally Honest. Thanks Mo, any time i'll be glad to use it and review it, I havnt had time to think about the church so its time to get er done. OK i was going to give it back to Tony next time I was in Cali. I may just take it with me and ship in from there. Ill let you know. Well, Mo you shared a nice video regarding cleaning of wand loaner. I know these loaner's are perfect for hard surface cleaning or narrow floors. I use this for for my truck mounted extraction system. You like better than a spinner James?